Debra is a native of Milwaukee. After working with clay for over thirty years, she has shifted her focus to fiber. She has been hand papermaking for over 20 years, working with the medium in a variety of ways, and has been fortunate to study with generous teachers. She enjoys sharing art through teaching and organizing/working on collaborative community art projects and environmental installations. Her current creative practice reflects her interest in minimizing her environmental impact. 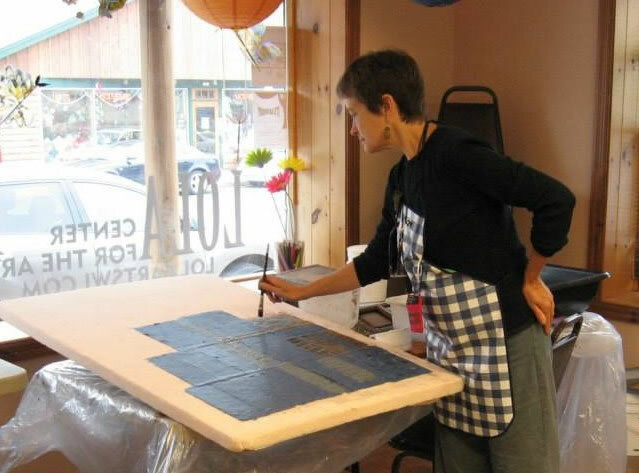 Debra’s most recent creative forays have been into natural dyeing and growing her own dye plants including Japanese Indigo and eco-printing as they relate to her handmade paper. She is currently the programming director at The Warehouse: Four Seasons Center for the Arts in Eagle River. Her Circle of Life Studio, where she also offers workshops and artist retreat/resident opportunities, is in Eagle River Wisconsin.